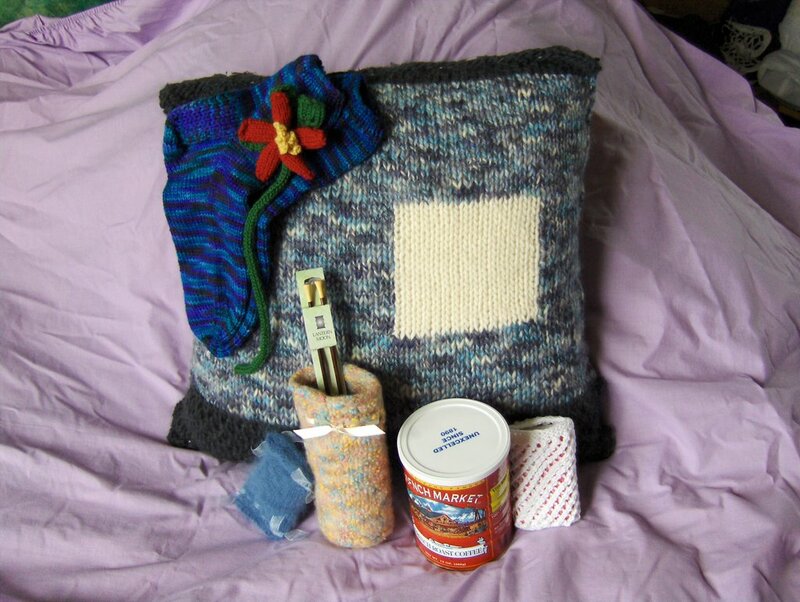 KEDkrafty: Parcel of knitted goodies. Feast your eyes on the wonderful array of gifts which Sarah from Louisiana has sent me as part of the Rowan International Exchange! Everything was beautifully presented too. 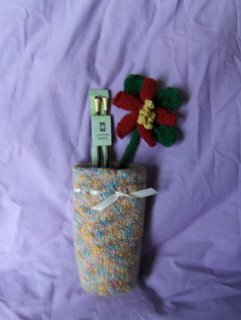 I have forgotten to add in the almond hand cream which Sarah sent too- I was too busy using it to remember to let it pose! Thank you very much Sarah for the very generous gifts you have sent across the Atlantic. I am delighted with all of them. This a lovely large cushion made in Rowan Chunky Print and other yarns. The back is made of an extremely soft suedette fabric in a toning slate grey colour. It is no wonder Sarah's little one kept saying how soft the cushion was! 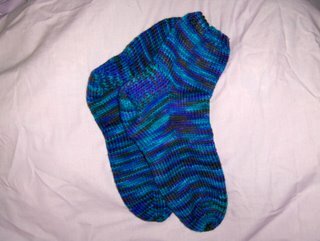 This picture shows hand-knitted socks which fit perfectly- if I had thought this through I'd have taken a pic of me wearing them. They are heavy socks for round the house on colder days. The colours are beautiful, but haven't come up quite right in this picture. 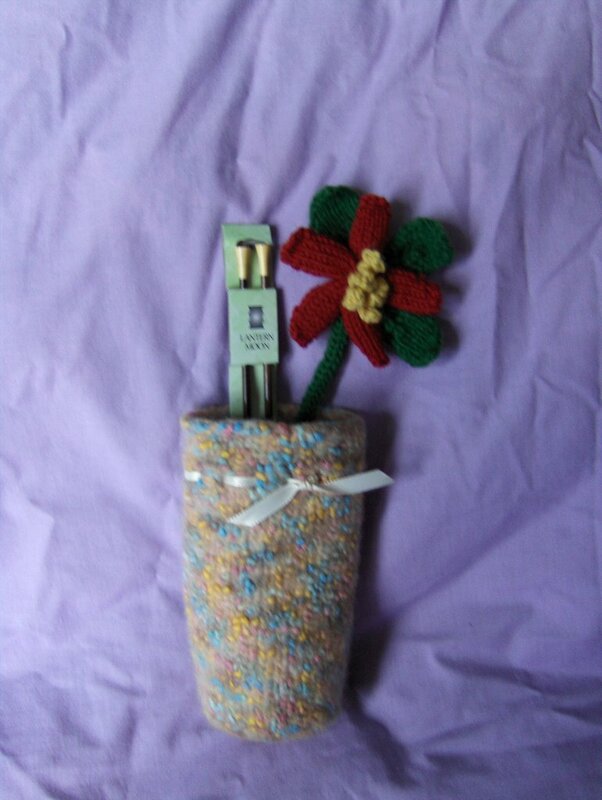 Here you can see a knitted and felted tub in what appears to be Chunky Print or similar storing some lovely Lantern Moon 4mm ebony needles (told you she was spoiling me) and a knitted flower which may become a corsage, you never know. 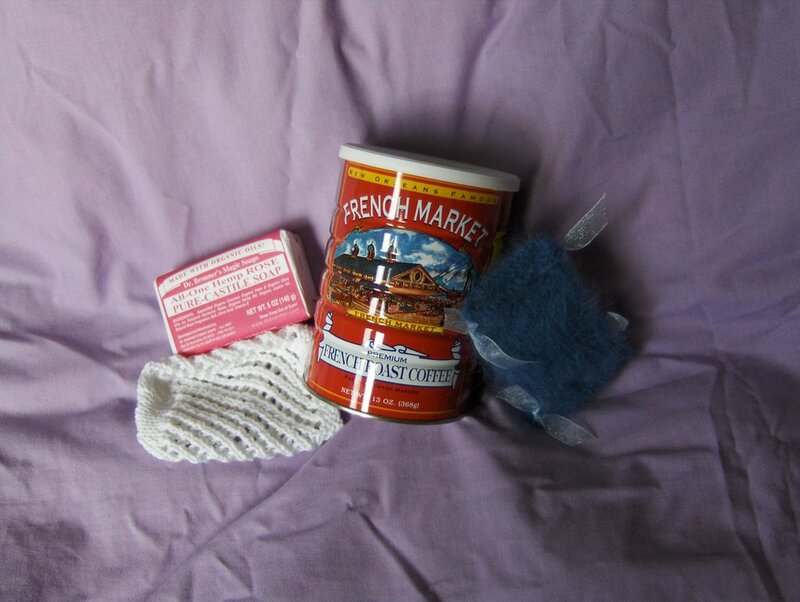 In this picture you can see a big tin of New Orleans French Market coffee, as well as some beautifully scented rose soap in its own handknitted cotton cover. 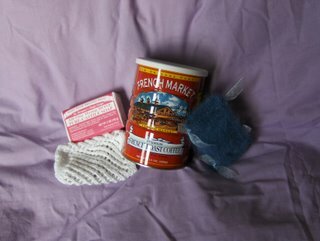 There is also a super soft fuzzy lavender sachet for my drawers. All in all I am delighted with my exchange gifts as Sarah has been so thoughtful and generous. In a couple of days I will show you what I am sending to my person (not Sarah) and if I am strong enough I may even spill the beans on my disaster. Oh what a lovely pile of goodies. I do love this whole exchange thing. I have really enjoyed reading about your travels and looking at the beautiful pictures. The island beaches take me back to some very happy holidays on Inishbofin, off the West Coast of Ireland, miles of deserted sandy beaches, wild horses and silence, bracing Atlantic dips to get us going in the mornings ready for another evening in a cosy pub listening to fiddles. I have always planned to visit Scotland one day and looking at your pictures renews my resolve, I think the children would love a holiday like that. Wow, what an amazing package! 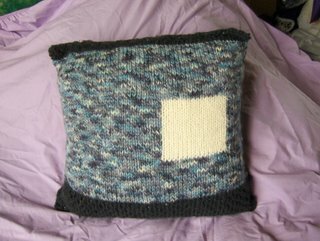 The generosity of knitters never fails to surprise and please me. Enjoy all your lovely treats! Great presents, particularly love the felted things and the colour of the socks is great. Have also enjoyed looking at the pics of your holiday. Really nice presents. Love the holiday snaps. Your man must love his food. lucky, lucky you.. what lovely things you have there! If every one is as spoiled as this then I'm joining up for next year - hope the near disaster wasn't too serious! I am so glad you are enjoying everything! I loved knitting for you. I think we have similar tastes. It really was fun coming up with things just for you!